The training program Creative Technologies in the Classroom (CTC) is a 3-month educative program designed by David Cuartielles and Arduino Verkstad in collaboration with Fundación Telefónica, Fundación la Caixa and Ultra-lab. It’s a toolbox comprised of more than 20 hands-on, easily assembled electronic experiments; an online source for course materials and documentation tools; and a collaborative space where teachers can meet with a moderator to share their findings and ask technical questions. It aims to train teachers of Technology and students to creative technologies, which means technologies empowering young students to make devices, machines, art-works, experiments etc., enable them to learn doing things and to express themselves as creators. Teachers are trained in programming with Processing and prototyping with Arduino, in order to become a mentor and help all along the program the students, following the different step-by-step experiments of the program. The beneficial aspect of this program is not only about acquiring new skills and technical knowledge but mainly on experimenting a different methodology of learning and transmitting knowledge, based on sharing information, questions, doubts, and resolving them together by experimenting. 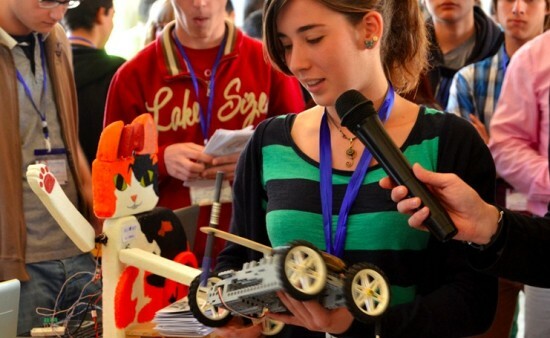 This project has been successfully implemented in the Region of Castilla La Mancha and Madrid involving 50 enthusiastic teachers, around 1200 youngsters who were able to invent, create and exhibit their project made with Arduino. Thanks to the support of Fundación La Caixa, the same program will be held in 50 colleges of Barcelona and a new edition, with the renewed support of Fundación Telefónica, will begin again in Madrid in 2015. My school would like to involve CTC program, but I can’t get to find more information related to participation. Could you please help me out?